Are you tired of cruising into a new port only to find that there is no protection on the pilings? Perimeter's Removable Post Bumpers are the solution that you've been looking for. 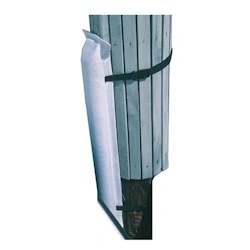 Made out of the same high quality materials as Perimeter's Dock and Post Bumper, this Perimeter Removable Post Bumper comes equipped with polyester webbing and a heavy-duty Delrin buckle system which allows for a quick, easy and secure installation. Simply wrap the webbing around the piling, snap the buckle and pull tight. When you're ready to depart, simply unbuckle and stow.